This weekend is one of the biggest plant shopping weekends of the year and the folks at Donahue’s in Faribault are certainly ready for it. I visited Donahue’s earlier this week for a behind the scenes tour with Mary McIntyre Donahue, one of seven (or is it eight?) Donahue relatives currently involved in the massive greenhouse and clematis operation, about 10 blocks south of downtown Faribault. The family has another growing range and greenhouse complex near Montgomery, Minn., as well. I was tagging along with Rose Eggert, CEO of the Minnesota State Horticulture Society, and Tom McKusick, Northern Gardener publisher. 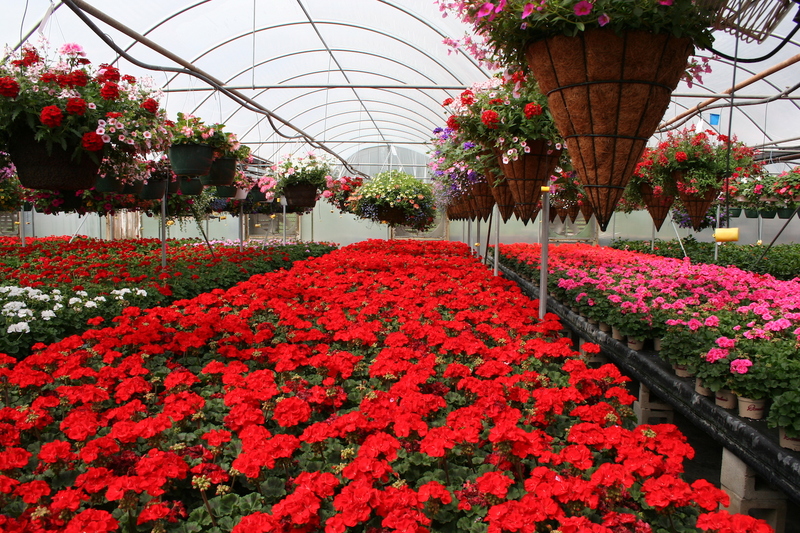 A room filled with geraniums at Donahue’s Nursery in Faribault. The photo above is of one of the geranimum areas at the greenhouse and retail operation. In a few weeks, these will all be gone — gracing porches, decks and patios all over Minnesota. Of course, Donahue’s is known nationally for its clematis. These climbers are tricky to propagate but the Donahues have figured a way to get more of the cuttings to take. Their catalog includes dozens of varieties. The key with clematis is to keep their heads in the sun and their roots in the shade. Clematis need five to six hours of sun per day, but they like cool, damp soil for their roots. 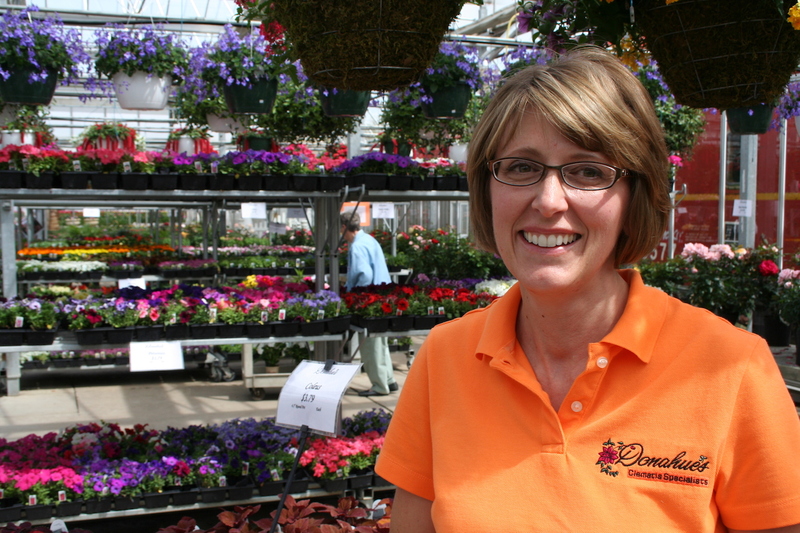 Donahue’s suggests planting annuals around them or a low-growing shrub nearby. Clematis also need support to climb and a litle patience from the gardener. It takes a few years to get a clematis to full size with lots of bloom. Finally, Mary settled that age-old argument: clem-at-us or cle-muh-tus. It’s the second one. Naturally, three plant nerds could not leave the store without doing a little shopping. I took home some Supertunia petunias (Vista Bubblegum — a great variety), Sutera ‘Giant Snowflake’ for a trailer in my containers and a ‘Bee’s Jubilee’ clematis for the pergola in my backyard. This clematis is a bi-color with streaks of pinks and white and is said to attract bees. Mary Donahue showed us around the nursery. « Seed Starting: Things Are Looking Good! Donahue’s is amazing, but I didn’t know they had a national reputation. I do try to get there most years. And good to know about the pronunciation of clematis (CLEM -uh-tus) , not that people easily change their ways on accustomed pronunciations!